For a beautiful and deep tan Sun & Sunbed ! Beta - carotene in combination with a complex of valuable vitamins for beauty , a unique formula of supporting the beautiful appearance of your skin. If you start to take beta - carotene for 2-3 weeks before tanning , dye accumulated in the skin will be reflected unfavorable rays and will act as a natural sunscreen . Beta - carotene, through accumulation in the subcutaneous tissue , give the skin a nice shade of tan . Beta - carotene accumulates in the skin and gives the skin a slightly brownish- orange hue. Beta - carotene, especially in a duet with vitamin E , an important antioxidant. Together neutralize the adverse effects of free radicals, which are a common cause of serious lifestyle diseases , such as atherosclerosis , cancer or diabetes . 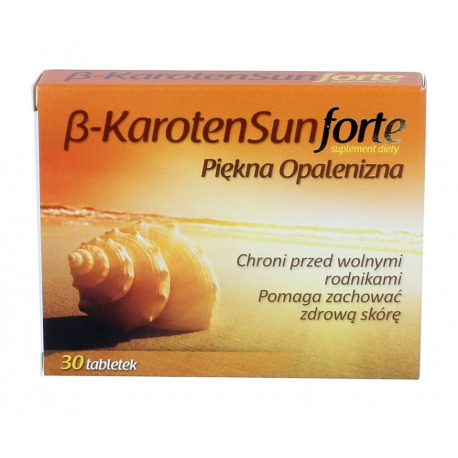 Dietary Supplement Beta - Carotene Sun Forte is rich with beta carotene , vitamin C and vitamin E.
Included in the dietary supplement vitamin C helps in proper production of collagen in order to ensure the proper functioning of the skin. Vitamin C helps in the regeneration of the reduced form of vitamin E.
Vitamins C and E help protect cells against oxidative stress - the production of free radicals that accelerate the aging process . Beta - carotene (provitamin of vitamin A) helps to maintain healthy skin . For dietary support take 1-2 capsule a day between meals.